Though it’s only three years old, Surfer Blood’s 2010 debut Astro Coast already feels like a product of its time. Born of indie-rock’s brief beach craze of the late ’00s and dotted with the peppy Afro-pop guitars recent college grads of the era were using to project worldly sophistication, it’s loaded with signifiers that had already been run into the ground by the time of its release. Despite all that, the record still sounds fresh. What it lacked in originality, it made up for in vigor and surprise—its twisty songs were hard to trace, with the band throwing back to ’90s alternative rock in unexpected ways. 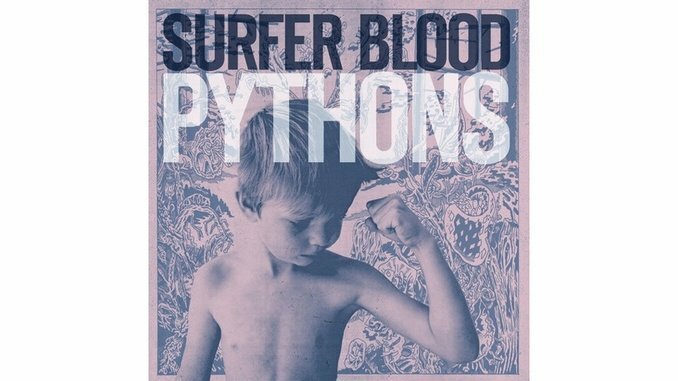 Those alt-rock signifiers carry through the group’s static sophomore album, Pythons, but the surprise is gone. Produced by modern-rock veteran Gil Norton (Foo Fighters, the Pixies), it’s heavy on buzzing guitars, thundering drums and “Where Is My Mind?”-style release—right down to singer John Paul Pitts’ Frank Black-ian hiss—but light on youthful joy and escapist charm. Even its most summery songs seem oddly burdened; the humming “Blair Witch” opens with Pitts reaching for literal sour grapes, and several tracks make allusions to being falsely accused, lyrics it’s impossible not to hear as responses to his 2012 arrest for domestic battery. Under even the best circumstances, those allegations were inevitably going to turn some listeners off of the album, but the way Pitts seems to wallow in them, letting them hang over the record defiantly, is off-putting at best and in borderline bad taste at worst. On Astro Coast Pitts stared at the bright, unwritten future in front of him, but on Pythons he’s locked in place, rendered motionless by the oppressive chip on his shoulder.